Who would have thought you can organize a festival for a water gun? Yes folks, that colorful toy guns that spit water especially made for kids has a festival in Korea. 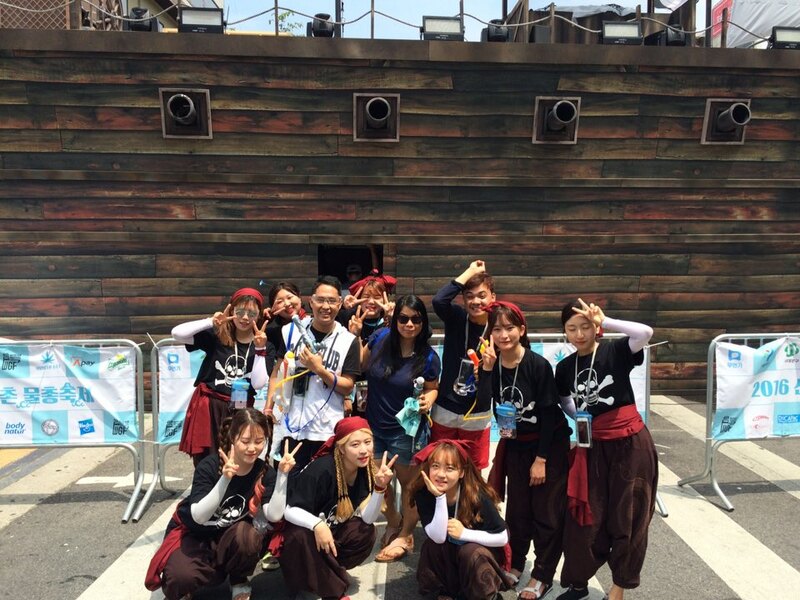 This festival is held annually in Seoul as a way to fight the heat of the summer. I actually attended last year’s celebration but I was just a bystander. I went to the venue just to watch. It was fun, but for me, it’s too childish and mature people like me should not join this kind of festival. Fast forward 1 year after that event, I found myself going to the venue with my Apollo water gun, rain coat, goggle and the determination not to get wet in the battle. 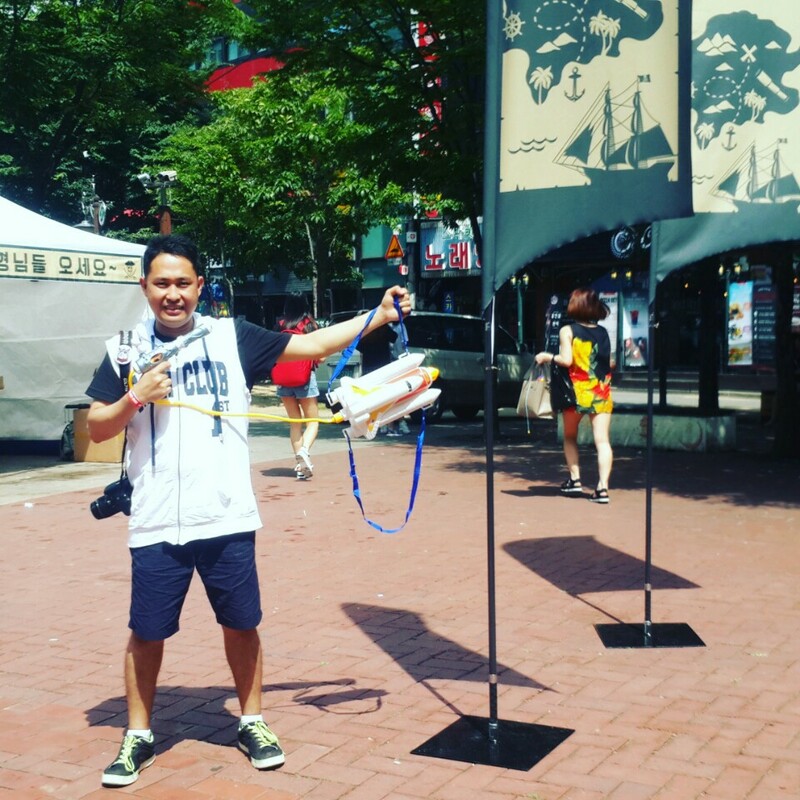 In short, I attended the 4th Sinchon Water Gun Festival, not just a bystander, but a participant in the battle. Thanks to trazy.com for organizing the registration for us foreigners. 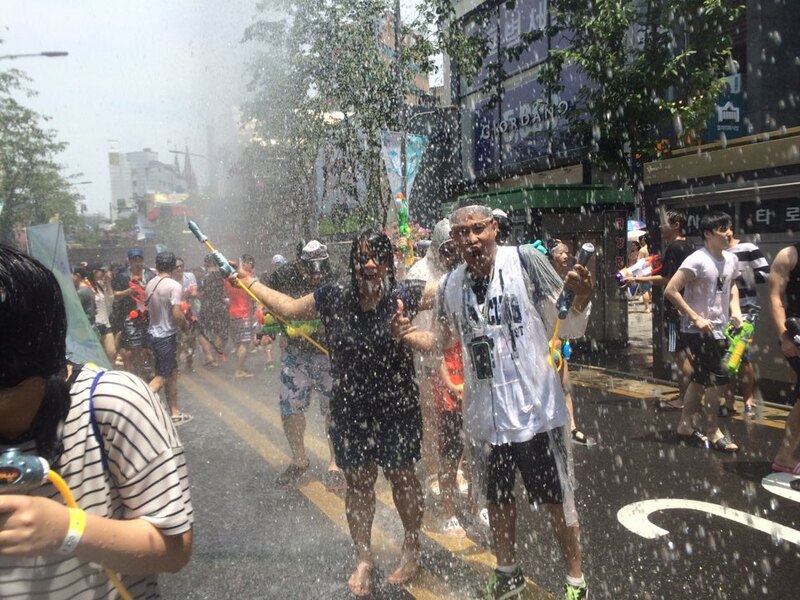 I booked for this a week before the event and for only 20,000 KRW, I got the whole gear for the water fight. The entrance to the festival is actually free, you can just go there with your water gun. What I like about registering to trazy.com is that they provided everything I needed including the use of changing room and a locker. It's a good ideas so people can just leave their bag while they get wet and wild in the battlefield. The festival runs for 2 days but I attended on the second day. The whole road at the area of Yonsei-ro right in front of the exit 2 of Sinchon Station was blocked just to give way for this event. As soon as I arrived, I already felt the youthful vibe. The kids/millennial/teenagers were still preparing the battleground for the water fight, and I realized I was too early. I proceeded to the ticketing booth to claim my package. Since I was too early, there’s no long line yet. In fairness, everything's organized at the ticketing booth. No hassle in claiming or buying the items needed for the event. Water gun vendors are also everywhere in the area. Depending on the type of the water gun, you can buy from as cheap as 6,000 won up to 15,000 won. The changing room is not really what I expected because it’s not actually a room. They just put up some tent where you can enter and change. The locker room is also not a room and not a locker either. It’s just an open steel divider installed in an open area where the staffs are in charge to assign a number to your belongings, put it in one big plastic bag and pile it up according to your locker number. But I just put away all my expectations. I just let it passed and went to the main event, the water gun fight! In the middle of the road, there stands a big pirate ship, probably to give some hype. Apparently, the pirate ship is not just a props, it actually has an area where some entertainers in the festival perform. At the top of the ship, there’s the sound system, a DJ and camera men to document the event. Of course, my favorite part is the battle ground. It feels so good to shoot people with water from my water gun without them getting offended. Try doing that at random people in the street and see if you will not get a punch or two. The downside is, while you are free shooting other people with water, they are also free to fire back at you, and of course, you are not allowed to get pissed off. No Killjoy here. But it was fun, fun, fun. People were dancing and shouting and enjoying the splash of water from the fire truck. I was wearing a raincoat but I found it completely futile. At the end of it all, I was all wet but happy with the experience. Aside from the water gun fight, there’s also a DJ party right in front of the pirate ship where people enjoyed good music and more water. I was too busy enjoying the splashing of water all over the area that I temporarily forgot it was summer and it was hot. 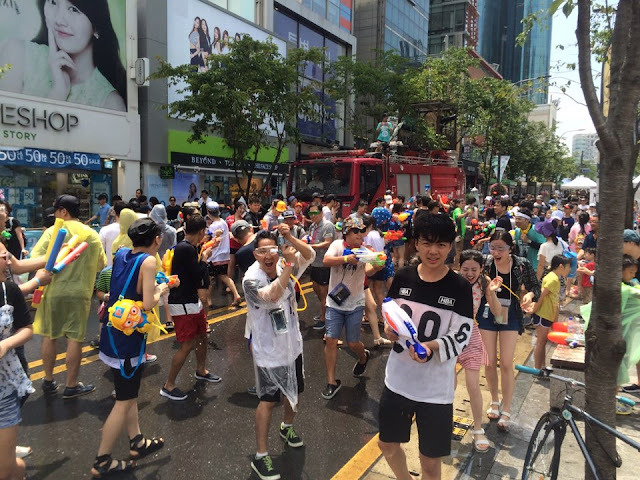 The Sinchon Water Gun Festival has proven that you don’t need to go to the beach to ward off the heat of the summer because you can actually have fun under the heat of the sun even in the middle of the city. I didn't even know Korea did this! How fun! It reminds me of Songkran in Thailand! It looks like you had an awesome day! Hey, that's a great excuse to be a kid again! You definitely look like you enjoyed the whole experience. 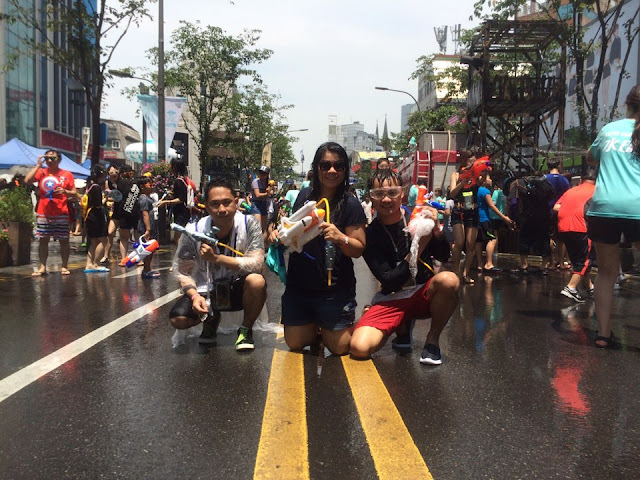 I think this water gun festival was inspired by the Songkran Festival in Thailand! If you want to see an epic water fight, you should get to Chiang Mai next April. The whole COUNTRY engages in a water fight, not just one city and it lasts for three days!!!! But I'm glad you had fun :D I remember how brutal those Korean summers can get. This. Looks. EPIC. I love when Korea (especially Seoul!) can let loose and do something so wacky and fun. I wish I had known about it, I would have so been there! Your introduction is so cool. First you say I'm too old for this and then proceed to describe the whole thing the next year. Great tip about the registration and changing lockers. I'm keeping this festival in mind. This looks super fun! Didn't know Korea has its own "Songkran" too :) I've participated in Songkran many times. I was traveling through Laos when their new year happened this past April and these photos reminded me of their traditional water festivals. It's a great time in Laos so I'm sure it is in Korea. Thanks for sharing! I'm jealous that you went, while i'm on vacation away from Korea. I saw this festival on Facebook and was hoping that it looked just as much fun as I thought. Glad you had a great time! This seems like a perfect place for childhood nostalgia! I remember we used to have super soakers and this would be perfect for this kind of event. Did you feel like a kid again? Korea has a festival for EVERYTHING!! That's one of the reasons my husband and I loved living there, there was always something to see and do. It looks like this was one fun festival! Hope you all managed to cool off! Oh my gosh, I missed out! I am continuously surprised by the amount of festivals here in South Korea! Thanks to you and your post, I'm living vicariously through you!